2014 Interaction Awards submission deadline extended to 30 September! Ahhh, we have some breathing room. Good news! We’ve looked at the schedule, considered when we need to hold peer reviews and when the Jury will meet, and have determined we can extend the 2014 Interaction Awards submission deadline from 15 September to 30 September! What does that mean? 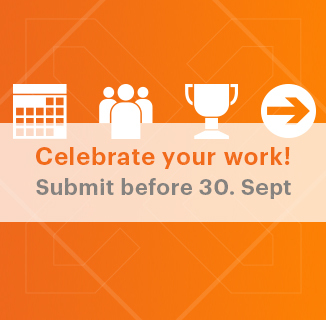 No excuse now – celebrate your work! Enter! Work with enterprise products? You’re working on tools and experiences that impact the worklife of many. From an improvement of an existing system to a totally new product, think about the impact your work is having and share your stories! Work with a start-up? Are you on to something that will change the way people live, work, or interact? Maybe you’re still in the concept stages but want to showcase the idea, or you’re up and running and seeing great impact. Share your stories! Work in healthcare? Are you changing how healthcare is provided, or impacting the experience of patients and staff? Share your stories! Work in an agency? Are you partnering with your clients to create cross-channel experiences? Are you dabbling with transactional work as well as those pushing the boundaries of design? Share your stories! Work in-house? Perhaps your products have been around for a while, and your team is introducing new features and services around it. Or maybe you’ve introduced a new product or service all together. Share your stories! Are you a student? Your concept work is plenty, and you’ve got a portfolio to strengthen. Maybe you’ve come up with something on your own or with other students. Share your stories! Pick a category (or submit to more than one): Connecting, Engaging, Empowering, Expressing, Disrupting, Optimizing. Tell us about your project – What opportunity was the project addressing? Who were you designing for? What impact did your project have? What was the design process? Then share a couple of images and a video that can bring the project to life. We’re not looking for high-production quality, nor gloss. Tell us your story, in the way you’re able to. Large company or small, student or professional, we need to celebrate great examples Interaction Design. Enter today!